Provide comfort for the family of Jack Nickerson with a meaningful gesture of sympathy. It is with great sadness that the family of Jack Murray Nickerson, 64 of Upper LaHave announces his passing on Friday, January 18, 2019 at the QE II Health Sciences Centre, Infirmary Site, Halifax. Born in Shelburne, he was the son of the late Cleveland and Virginia (Atwood) Nickerson. 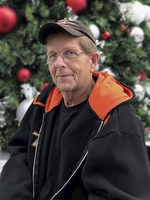 In his earlier years, Jack worked with Department of Highways for a number of years and then went on to start his own landscaping business, Distinct Design which he was so proud of and he worked so hard for his landscaping clients. An avid outdoorsman, Jack enjoyed camping with family, snow plowing in the winter for friends and looked forward to his winter trips south with Judy. Jack is survived by his spouse, Judy Corkum, children, Amanda Randell (Carl Crowell), Weymouth, Tia Randell (Neil Johnson),Timberlea, Tiffany Buffett (Andrew Burrell), Calgary, Kyle Buffett (RobinTanner), Lunenburg, 6 grandchildren, sisters, Dianne Nickerson, Victoria, BC; Pamela (Robey) Hatfield, Upper Port LaTour; brother, Arthur "Bud" (Diane) Nickerson, Centreville; father-in-law, Leon Corkum, Middle LaHave. and several nieces and nephews. A memorial service to celebrate Jack's life will be held Thursday at 2:00 p.m. at the Dana L. Sweeny Funeral Home, 11213 Hwy. # 3, Lunenburg, Rev. Willis Ott, officiating. Interment will be at Riverside Cemetery, East LaHave. In lieu of flowers memorial donations may be made to the ALS society or to Riverside Cemetery, East LaHave. To plant a memorial tree in honor of Jack Murray Nickerson , please visit our Heartfelt Sympathies Store. We are so sorry for your loss, Judy. Our deepest sympathy.